Business Strategy | Select Strategy Inc.
We work with clients to develop solid business strategies and align them with their human capability and systems. We develop and integrate customer centric strategy with organizational and human capability, ensuring that strategy becomes reality. I. Competitive strategy which is made up of customer focused strategy and knowing your competition. II. 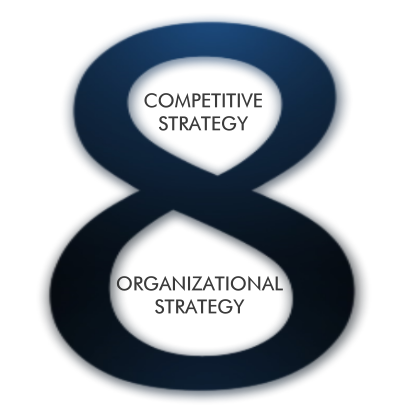 Organizational strategy which supports and must be aligned with the competitive strategy. These two parts need to work together to ensure an overall successful strategy. What markets and customers should you serve? How does this align with your current business strategy and tactics? What do your existing customers think about you? What are your strengths and areas for improvement? What can you learn from them? Where is your sweet spot? How profitable are the different customer segments now and are likely to be in the future? How should you serve these "profitable" customers? With what product / service range? Typical Methodologies include secondary market research, primary customer research including customer focus groups, in-store intercept survey and customer surveys, customer segmentation maps, financial sales and contributions analyses, amongst others. Who are your current and potential competitors? How are they likely to react to your strategic moves? How do you counter these competitive threats and differentiate yourselves from your competitors? What specific people skills do you need to deliver on this business strategy and how should you hire or develop these skills? Typical Methodologies include competitor analysis, formulation of on-going capture of data and analysis methods, financial analyses, modeling to predict competitor moves, amongst others. What is the organization's vision and mission? Is it clearly defined? Is the organizational structure optimized? What should the hierarchy or organogram look like? Who should report to whom to achieve business goals and given employee competencies? Are there clear roles and responsibilities? Have you completed the appropriate job analyses, job designs and job descriptions? How do you define goals and key performance indicators for each department to support business goals that are in line with overall company objectives. How do you track your organizational performance? What type of analysis and indicators should you use and how often should you measure, analyze and adjust your direction based on this information? Typical Methodologies include inefficiency diagnostics tools, a review of organizational structures, interactions, workflow and dynamics, sophisticated proprietary online employee and customer survey analysis, performance management and goal management methodologies. All these methods are incorporated into our proprietary organizational measurement, development and diagnostic tool set.